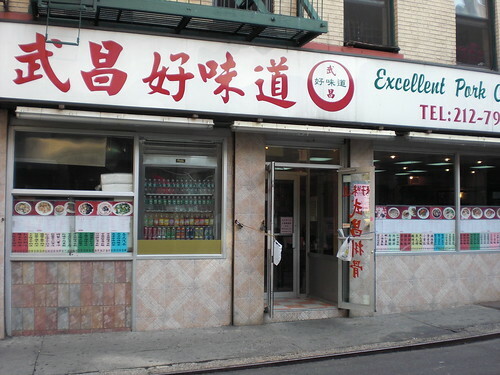 Well played NYC, you managed to satisfy my Taiwan food desire (if only for a few hours). A trademark dish in Taiwanese culture, pan fried pork chops cut over rice ladled with pickled vegetables and pork sauce, is something akin to soul food to me. As an Asian American, I freakin' love rice. As a fat kid, I love fried things. When you combine the two, something magical happens (I stop complaining about Columbia and I'm just generally a happier person to be around). Anyway, I've always known about Excellent Pork Chop House, I passed by it almost every week when I went around to all the noodle shops, why I didn't go for such a long time... I'm not sure, but I've been several times over the past year. 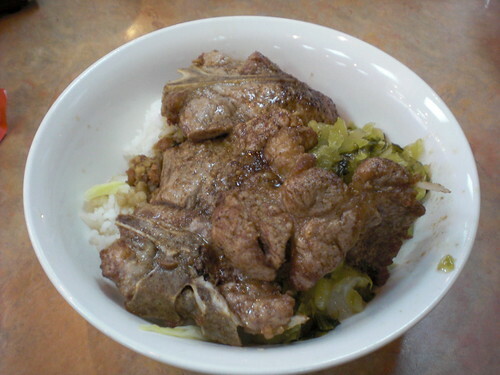 First time I went (by myself... sadness), I got their trademark dish, pork chop over rice. An bone-in pork chop is pan fried and served over a rather generous portion of rice and pickled veggies also known as 酸菜 (suan cai). Their pork chop wasn't all that crispy compared to that at Hua Ji, but it's more than adequate in terms of taste. Well spiced, and not overcooked, the meat itself was adequate. The sauce and pickled vegetables were the star of the dish though, overloaded with MSG, it just reminded me of the stuff that my grandmother makes. For $5, I would've been happy to just have rice and sauce. The pork was just an added bonus that was kind of... there. Second time I went back, it was for my friend Chris' birthday. Naturally nothing went to plan, and one of us showed up about an hour late (hi Wayne!). I went with the alternative, this time going with the chicken leg over rice. As far as this dish, it's more of the same (as the pork chop I mean). 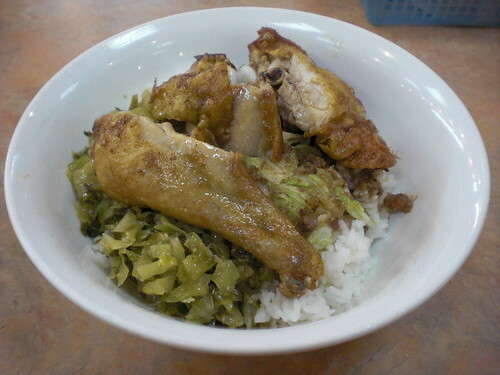 The rice and the sauce are tremendous, the chicken leg could be better. It was just the right amount of greasiness, and the taste of 五香 (wu xiang) was certainly there, but the meat to bone ratio was a just a bit too high. Still, for $5 the sauce and rice would've sufficed. In summary? I like this place. It's not amazing, and you shouldn't expect it to be. To kill a craving though, it's certainly up to par. OH, and they have shaved ice (although I didn't try it... I didn't want to ruin my image of that with a substandard interpretation). It's a good thing you skipped the shaved ice; last time I was there it was all...chunky and meh. But YAY FOR PORK AND RICE AND PICKLED VEG! Before my mom went back to Taiwan, I made sure to ask her to precook me a giant batch of the pickled veggies. That didn't very long. Glad to hear I didn't miss out on much with the shaved ice though. First thing I'm gonna do after graduation (well aside from pack and hop on a plane and all) is get beef noodles and shaved ice.